As towing and braking systems have evolved to be mainstays of the RV experience, maintenance of these systems becomes part of the regimen of using the towbars and braking systems. Tow bars require regular inspection and maintenance. All connection points should be firmly connected to the other component without free play. Many systems use nylon washers to provide the spacing required between components and to allow ease of movement. As a general rule if the components can be "set in a position and remain there" then they are adjusted correctly, if they flop side to side or up and down, the components need to be tightened up (by means of the attachment bolts) or require replacement of the nylon shim/washers. If the shafts are able to be moved vertically in a direction 90 degrees to the direction that the tow bar arms extend then it is likely that the bar has worn to the point where it requires replacement. If a tow bar is five (5) or more years old and frequently used, it is likely that it has worn to the point where it is outside of the maker’s specification. If you are unsure, take it to a dealer or manufacturer’s representative to have it checked and either rebuilt or replaced if required. On Blue Ox tow bars the shafts are covered by rubber coiled boots held in place by 3/8” wide nylon zip lock ties. Cut off the old ties, at both ends, slide the boots away in one direction and wipe the rod clean, then repeat from the other end. Apply fresh white grease enough to provide a thin covering over the full rod and reinstall the boot, securing the boot with new ties. Repeat for the other arm. Ensure that the arm locks lock and release easily. Use high quality silicone to lubricate them. Use this silicone on any other towbar lubrication areas. Before reinstalling into the Hitch Receiver ensure that the plug in portion is not showing any signs of cracking and that the pin hole is not elongated. If any of the fasteners or components are missing or damaged, now is the time to replace them. Connect the tow bar to the towed vehicle and RV, air up the RV if it has air suspension and look at the tow bar. Ideally it should be level. If it is not, the latest tolerance specifications now recommend a fall of no more than 2” (5cm) or an incline of no more than 4” (10cm). If it is outside of these dimensions, add an appropriate drop/riser receiver, rated for the weight classification of the towed vehicle and tow bar. Check the safety cables for damage, and if frayed, replace them with ones rated as above. Check the wiring cable extension for any damage or poor connections. I recommend a coiled six wire version with a six pin round connector on each end with a six pin receptacle on the tow car. Use a six pin round to the typical seven pin blade connector found on most newer RV’s, cross wire-tying the cable end to the adapter. This creates a coach end and a towed vehicle end. If the cable extension is suitable, apply Corrosion Block® to the connections at each end. Check the towed cars lights to confirm that all lights are functioning. Check them each time you tow, it is a good habit to check them each day that you tow if on an extended trip since lights do fail and wiring can become intermittent. I recommend using lighting systems installed so that they use the towed car's existing built in rear lights or those that add an additional bulb (or LED) installed into the taillight housing. 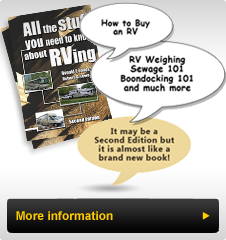 This method reduces the chance of failed wiring or poor connections inherent with added on lights that require running the wiring from the RV to the rear of the tow vehicle each time it is towed. Built in systems typically have heavier wiring and better ground connections ensuring much more dependable lighting. Enjoy towing your tow vehicle this summer.